The Noble Prize winner American Writer, William Faulkner has written many critically acclaimed short stories, plays, screenplays, essays and novels. He is considered to be one of the most important writers of the American southern literature and ranked shoulder to shoulder with other significant writers such as Robert Penn, Harper Lee, Truman Capote and Tennessee Williams of the same genre. Surprisingly, Faulkner was not very well known before being awarded the 1949 Noble Prize in Literature. Two of Faulkner’s books, A Fable (1954) and The Reivers (1962) won him the Pulitzer Prize for Fiction. Faulkner’s achievements include his novel, The Sound and the Fury (1929) being ranked number six on the Modern Library’s 100 best English-language novels of the 20th century list. Also on the list were two more novels by Faulkner, As I Lay Dying (1930) and Light in August (1932). 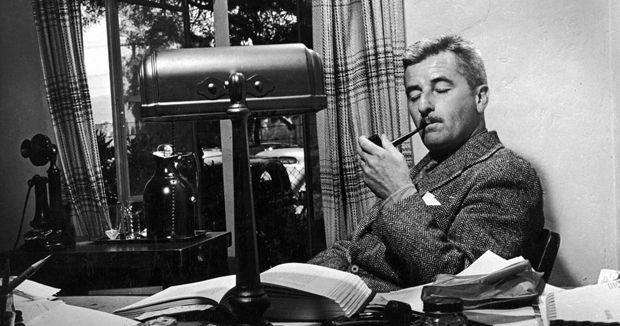 William Cuthbert Faulkner was born to an old southern family on September 25, 1897 in New Albany, Mississippi. He was the eldest of four more sons of Murry Cuthbert Falkner and Maud Butler. Faulkner grew up in Oxford, Mississippi where his family moved in 1902. This history and culture of the American South posed a great influence on Faulkner throughout his childhood and also on his literary work later on. Faulkner’s mother and grandmother who were avid readers, photographers and painters played an important role in his artistic and visual language education. He enrolled at the University of Mississippi and was also a member of the Alpha Epsilon social fraternity. Faulkner also attended Ole Miss in 1919 but dropped out in November 1920 after three semesters. Although Faulkner wanted to join the United States Army, he was not accepted due to his short height and joined the British Royal Flying Corps instead. Faulkner wrote his first novel, Soldiers’ Pay in 1925. The beginning of 1920s till the outbreak of World War II was the most productive period of Faulkner’s writing career. In addition to numerous short stories, Faulkner published 13 novels. Some of his most celebrated novels include The Sound and the Fury (1929), As I Lay Dying (1930), Light in August (1932),and Absalom, Absalom! (1936). Faulker’s short stories such as A Rose for Emily, Red Leaves, That Evening Sun, and Dry September have also contributed immensely to his fame. In addition to these, Faulkner also composed two volumes of poetry The Marble Faun (1924) and A Green Bough in addition to a collection of short crime fiction stories Knight’s Gambit (1949). Faulkner’s work has widely been appreciated for its experimental manner, contemporary themes and the often used stream of consciousness technique. In 1929, Faulkner married his teenage love Estelle Oldham. They lived at Rowan Oak with their daughter Jill until Estelle’s death after which the property was sold to The University of Mississippi. Faulkner’s other romantic relationships outside marriage included affairs with Meta Carpenter, Joan Williams, Else Johnson and Jean Stein. William Faulkner died from a myocardial infarction at the age of 64 on July 6, 1962. He is buried at the St. Peter’s Cemetery in Oxford.